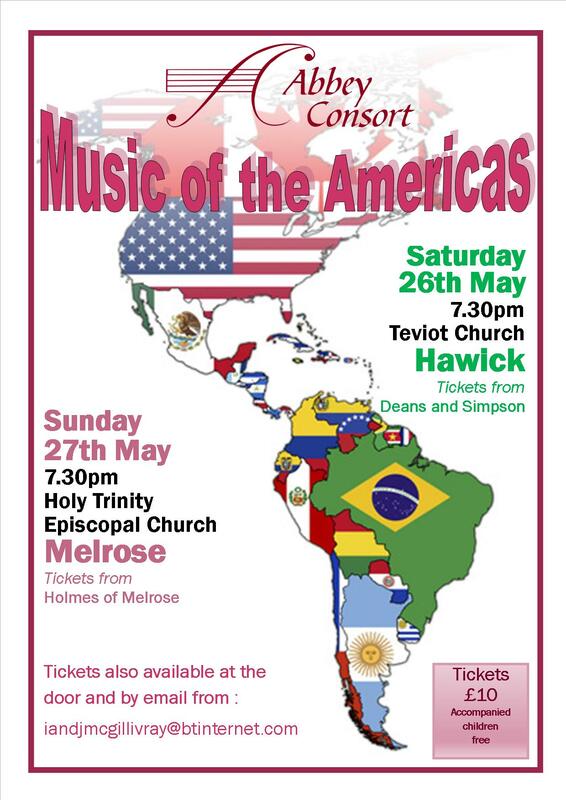 Abbey Consort is presenting their spring concert“Music of the Americas”in Teviot Church, Hawick on Saturday 26th May and in Holy Trinity Episcopal Church, Melrose on Sunday 27th May – both concerts starting at 7.30pm. This exciting programme covers a wide range of music with the first half featuring music from South America, including the beautiful folk-mass, Misa Criolla,by theArgentine composer Ariel Ramirez. In this delightful piece the choir will be joined by Ross Milligan on guitar,plus a small instrumental ensemble. Ross willalso play two evocative solos:Evocacionand Joropo fromSuite del Recuerdoby the ArgentinianJosé Luis Merlin. The second half takes us to north America with two marches by the effervescent American composer John P. Sousa, performed on the organ by Morley Whitehead. With 2018 marking the 100thanniversary of the birth of the American composer, Leonard Bernstein, Abbey Consort will sing his Chichester Psalms, a dramatic and joyful piece accompanied by organ, harp (Zuzanna Olbryś) and percussion (Finlay McDermid). A spectacular harp solo – Baroque Flamenco –will be followed byRandall Thompson’s rarely heard, but hauntingly beautiful Alleluia before the popular Make Our Garden Grow from Bernstein’s Candide brings the concert to a stunning close. This concert is full of top-notch talent on all levels and, with such different and unusual instrumentation, will be a concert not to be missed. Although some composers might be unfamiliar, the programme has a rich variety of vibrant, rhythmic music which is a joy to the ear. Why not come and join us on our musical journey from Machu Pichu to Massachusetts!” Concert tickets [£10] are available at the door, or in advance from Deans and Simpson, Oliver Place, Hawick and Holmes of Melrose.